To paraphrase Will Rogers on Oklahoma weather, if you don’t like the new PJ Harvey album, just wait a while. Over the last two decades, Polly Jean Harvey has reinvented herself with each new release, although rarely as dramatically as she did with 2007’s White Chalk, on which she swapped snarling guitar and visceral vocals for a wispy, piano-driven sound. Let England Shake, her first solo album in four years, finds Harvey picking up her six-string once more, but she spends as much time strumming an autoharp as plucking out riffs, laying hands on saxophone, zither, and violin as well. With frequent collaborators Rob Ellis and Mick Harvey, Harvey recorded the album in a church overlooking the sea near her home in Dorset, England, and listeners can practically hear the crash of waves against the cliffs as she looks out across the ocean. Harvey’s songs have always been devoted to plumbing the depths of the soul, but on Let England Shake, she turns her gaze outward, surveying the wreckage of wars past and present, and confronting her mixed feelings toward the country she calls home. With a short break to let in the wood-burning-stove repairman, PJ Harvey called The A.V. Club from Dorset to discuss the “hard work” of songwriting, why she now writes words before music, and the combined influence of Salvador Dalí and Cambodian folk music. The A.V. Club: You only played a few dates around the release of your last solo album, White Chalk, and you’ve talked about wanting to get away from the constant cycle of writing and touring. What tells you when it’s time to make a new record? 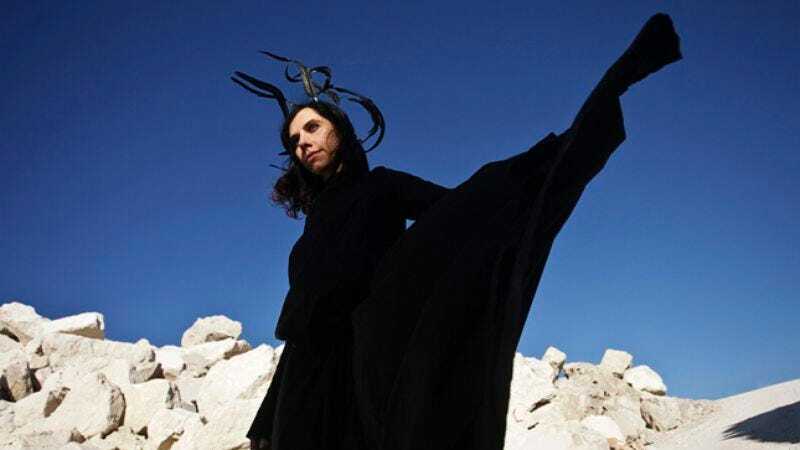 PJ Harvey: Well, I’m always writing, the past 10 years. A lot has changed, in that it’s something I do every day. I work on words quite separately to music. They’re both ongoing, and I don’t ever feel like I’m working in a cycle in that respect, because it’s every day anyway, no matter what I’m doing. Then I get to a point when I’ve collected together enough words that seem like they want to be songs rather than poems, or sometimes not. I work on words, mostly, toward them being poetry or short stories, and then some of those become songs. They all find their place in the world, but they all start off in the same place. I’m always painting and drawing as well, and it’s an ongoing creative assignment. I don’t think that much anymore in terms of “write a record, record a record, tour a record,” because in my own mind, things have changed, in that I’m just an ongoing artist. I’m not quite sure what the next project needs to be until it presents himself, and then I know. I just follow dutifully while I’m being led. AVC: When you talk about writing lyrics every day, are you compelled to do that? Is that a discipline? Do you sit down at a certain time and say, “I have to write for two hours,” or “I’m not getting up until I’ve written three songs”? PJH: Well, the desire is there. It’s something I want to do very much, and it’s something I’m very interested in. There’s also a level of discipline I use as a writer, designed to get better at what I’m doing, that requires quite a lot of study and quite a lot of hard work as well. AVC: The sculptor Richard Serra said “Work comes out of work,” which is another way of saying that what distinguishes a fully realized artist from a merely talented one is the discipline to practice your craft. It’s not just waiting for the almighty to send down fully completed songs. There’s a work ethic involved. PJH: It’s a lot of hard work. I consider it my lifetime study. I work at it every day, all day every day. I treat it like my life’s work, which it is. It’s also this thing that I love, desire to do, so I write about it and try to improve upon it, more than anything. I’m not a writer where I feel particularly blessed by great inspiration every day. I don’t. I have to work really hard at it to try and say the things I’m concerned with. AVC: Does the fact that you’re writing words first and then deciding what ends up being a poem or a story or a lyric influence the form of the songs? In the simplest terms, the songs on Let England Shake aren’t structured as a series of rhyming couplets. They’re much more story-oriented. PJH: Some of the songs on this record started off as poems, but then to grow into a song, part of them would need to change. There’s so much you can do with laying words on a bed of music. You can completely change their meaning with the type of music or the way they’re sung. When a poem might become a song, then certain parts are repeated and might become a refrain or a chorus, so they change in that way. But it’s more the nature of the words and what they’re saying that determines whether it’s a poem or a song. Some things lend themselves well to songs, some things don’t, and I’m learning that a lot at the moment. It’s still a relatively new way of writing. It’s only really the last five to 10 years that I’ve taken my writing seriously in this way, as something I can keep working toward. I think I feel myself much more before as simply a songwriter. AVC: There’s a striking contrast between the words and music on some of the songs. The chorus to “The Words That Maketh Murder” is practically jaunty, and on the title track, you’ve got a sing-along to the words “deformed children.” It’s very lyrical, and there’s a lot of space in the music at the same time as you’re talking about people getting killed. PJH: That was very important, and very much at the forefront of my mind with this record, because when I put enough words together, I realize that I have to really avoid putting even weightier music to words that already have such weight, because it really would have sunk everything. So I have to do quite the opposite musically. The words were doing so much already, so the music had to bring an energy and a lightness to the words in order for them to be heard, really, without getting too weighted down. AVC: From the title on down, Let England Shake is concerned with conflict between nations and within them. It’s also the first record you’ve released that doesn’t have your picture on the cover. It isn’t an impersonal album, but you’re looking outside yourself more than you have before. Is that a function of the songs you’ve been writing, or did you specifically select material with that theme in mind? PJH: It was a whole body of work. I knew exactly what I was heading toward. I specifically wanted to deal with the world in which I was living, in which we’re living. It’s been quite urgent and important to start trying to put these things in songs. I’ve always felt profoundly about what’s going on in the world on a daily basis. What I hadn’t felt was that I was at a point in my writing career where I could write about these things in songs and do it well. I didn’t think I was at that stage, or had the skill to do that yet, and it’s only really the last three or four years in writing this album that I began to try, and having learned more, being a bit older, and having the confidence to try to put some of the world into the song. AVC: You’re talking about being inspired by what’s going on in the world, and yet a lot of the songs are open-ended in terms of their subject matter, and some reach back into history: “All And Everyone,” “On Battleship Hill,” and “The Colour Of The Earth” all reference the Gallipoli campaign of World War I.
PJH: There’s a whole variety of lyrics going on on the record, everything from World War I up to Iraq, or possibly Bosnia. I had all these different wars in my mind, and many different countries in my mind, and although I specifically refer to countries, i.e. England, or specific wars, I wanted to also tap into the emotional quality. If it’s a song that’s addressing England, there could also be emotions that other people could recognize in their own countries, or the way they feel about their country, and that comes about from trying to use language that can remain open enough that other people can enter, and also to look at conflict over the past hundreds and hundreds of years to highlight these endless cycles, the way history repeats itself, to be relevant today, and describing past conflict. AVC: You listened to a lot of folk music while you were making the record, and not just from the British tradition. What did you find in that music that was helpful to you? PJH: Well, listening to the emotional quality of traditional music, everything from Cambodian traditional music to Russian to Chechnyan, Georgian, Indian— as much as I could find of anything, as well as Irish, English. I would listen most particularly to the countries whose language I didn’t understand, didn’t know what they were singing. But being a singer myself, I could understand because of the emotion. Maybe you’re a singer or not, but what taps into the soul leads to the heart, and that’s really what I came away with, with the starting point for the record being that I could speak as a human being and feel things very deeply. And that’s the thing we all have, whether or not I have access to every piece of political knowledge there is to know about these subjects. No, I don’t. But what I do know is what it makes me feel. That’s what I wanted to try to discuss, the people who are on the receiving end of the decision-making. What’s it done do them? AVC: Did you hear a lot of folk music growing up? Did you come to that later? PJH: I didn’t know folk music growing up, no. It’s something I’ve come to study, really, because I think there’s so much to learn from traditional music in the sense of the way music began as a way of communication, the traveling storyteller, the bard, the minstrels. At one point, that was the way to carry news from one province to another. That influenced me a lot with the way a song began — a way of recording history or speaking to nature, or a way of relaying news from one part of the world to another. That’s why I studied traditional music, and not just from the Western world, either. I always need to get translations of those. They’re at the very root of what somebody like myself is trying to do now. It’s the way to go back and tap the source, and then bring that into the world of realism. And then you have to find your own equivalent for today. AVC: Was listening to those different kinds of music how the samples found their way onto the record? Some of them are prominent, although they don’t fall into line with the rhythm or melody you’ve set out. PJH: Everything that comes together to make this record what it is wasn’t particularly planned. It is down to following my instincts as a writer. It could be something very simple. It could have been, I’ve heard that song in the car on that day as I was driving. It somehow could sink into my consciousness when I was writing a song, and become part of that song because it was in my mind. It could be something as simple as that. I didn’t clearly study folk music. I was listening to many, many different things. I meditated a lot on the music of The Doors, the music of The Pogues, The Velvet Underground. I listened to them over and over. I also looked at a lot of artwork, Goya’s Disasters Of War and the Black Paintings, and I looked at Salvador Dali’s Spanish Civil War paintings. I read a great deal—obviously a lot of historical books, but I did a lot of Internet research and looked at a lot of documentary footage from war zones of today, from the civilians who were affected, and the soldiers. I just gathered as much information as I could. So many different pieces went into the record sounding like it does. There wasn’t a great master plan, other than knowing I wanted to address these songs to the world, and that I knew it had to have a certain lightness about it. I knew I didn’t want it to be heavy, finger-pointing or dogmatic in every way. It had to remain ambivalent somehow. AVC: That ambivalence is strong on the record, particularly with regard to England, which you express a lot of love for and a great sense of connection to, but also a great deal of despair and disappointment toward as well. Is that something you’re actively working through at the moment, trying to figure out how you feel about this place you come from? PJH: I think that’s something many people all over the world are feeling right now, and I feel that thing too. It doesn’t matter where I’m from, or if I’m relating to my country or not. I’m tapping into what everybody’s feeling because that is the thing that’s palpable. AVC: The title track of Let England Shake first surfaced as a TV performance, and a lot of people were shocked to see you onstage with only an autoharp. Is it helpful for you as a songwriter to experiment with an instrument like that, where you have a fixed set of chords to choose from? PJH: It worked well with the way I was writing this record, because I wrote the words first, but then I held onto the world for a long time until I found the melody. So then all I have to do is fit the chords into music. I’ve already got the melody. AVC: You’re playing saxophone on this record, something you haven’t done much of in 20 years. Does that spark new things for you, to keep switching the instruments you’re playing? PJH: It’s so much in me to want to keep experimenting all the time. It’s just inherent. Therefore I keep reaching for instruments I don’t particularly know how to play, and then I become excited. That gives me energy to want to make new things, and it forces me to hear things in new ways, which then can only help to say things in a new way.